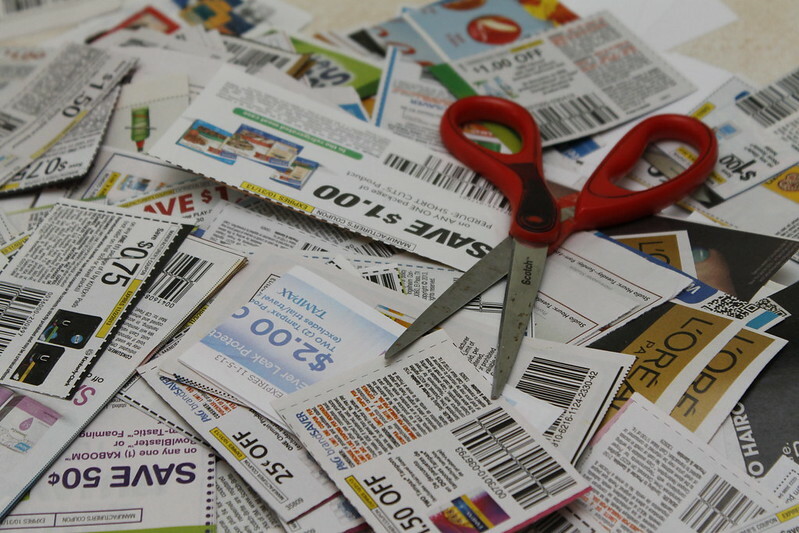 Coupons and Store Cards Entice Us To Spend! I have an inquisitive mind. I also like contests and coupons that give you something free. You know what they say: If it seems too good to be true, it probably is. You would not think that it would apply to coupons from your favorite places such as grocery stores, clothing stores, etc. Each week there are coupons in the newspaper. Each week my Sunday paper comes with those colorful enticing ads. My mailbox, both snail mail and email, are full of exciting offers that tell us we can’t pass up the latest and greatest deal. This week, as I was sorting through all the paper I have accumulated, I looked at all the receipts that I have that offer you something if you go online and take a survey about your visit. I usually toss the receipts. I decided to put my receipts in a pile and actually take their surveys. At one store, after taking the survey, I received $5 off my next purchase of $25 or more. It has an expiration date. Another receipt gave me a free cookie on my next visit. I missed the deadline on two receipts. I decided to try it anyway. One of the receipts registered me for their drawing and another told me I was too late. The other receipts registered me for drawings for a prize of anywhere from $500 to $1,000. As I looked in my billfold I also sifted through all the cards that I have that are reward cards. If I would carry all my reward cards I would need another wallet to carry them. Many of the cards I have, I use when I take my grandchildren to places such as Orange Leaf and Cherry Berry and more kid-friendly, fun establishments. I have reward cards for Erbert & Gerbert’s, Lego, Ulta Beauty, Shopko, Panera, Hy-Vee Gas, Lowe’s, Caribou Coffee, Pizza Ranch, Petco and the list could go on. I sift through my cards before I leave my house if I know I am going to be going to one of these establishments. I admit, I do frequent some of these more often because of my rewards cards. I used to be the coupon queen when I had kids at home. No grocery item was bought without a coupon. I carefully planned my shopping trips. Now that we are empty-nesters, except for the Meow Twins that inhabit my house, I am not so careful. I do find myself looking at the coupons each week and cutting them out, thinking I should buy something. If I look at the coupons when I am hungry I cut out the coupons for things I would never buy, but look good on the coupons. That is probably the reason for coupons. Moving on to store cards. I love birthdays because the store cards send coupons for $10 and $15 to use in their store. There is no catch, you do not have to buy anything else. If you have a lot of will power that works. You visit the store and spend only the amount that they have given you. There is one store that used to put the coupon in the paper. I would suspect there are more people that don’t have willpower and those coupons bring people into the store and they buy more than their $10. J.C. Penney a few years ago tried doing away with sales and it almost did them in. There is something about a coupon and a sale that brings the I-need-this out in people. Although for me, I loved the prices that J.C. Penney offered, but I did not like the ads so I wasn’t drawn in. I thought it was interesting that when the iPhone 6 came out there was such a frenzy to get it. I love my iPhone 5 but I also know that quirks and bugs usually come with something new. On Sunday’s as I read through the ads I find so many things that I know I need. I am very lucky that I have to drive for miles to get that product I absolutely can’t do without. By the time I get around to driving those miles I have usually decided I don’t need it. The key word to all of this is time. How much time do we spend trying to save money but only end up being tempted and succumbing to buying more because we have a deal? I am going to continue taking the time to register with my receipts as an experiment. Will I be a winner? Tune in for updates. Next A New Page In My Life!